"I said screw the status-quo and started working on my dreams of perpetual travel, exploration, and adventure." So said Becky Schade, tiny camper owner in 2012 at the age of 28, when she chose to follow the full-time RV life. Is she on a budget? You bet, but she's quite articulate about why she chose to leave her 9-to-5 and hit the road. "I've thrived on about $16,000 a year. I am not a genius. I was a truly average student in high school and college, no honors courses or distinctions of merit here. What I am, though, is determined to make my life the best it can be, no holds barred. And if I can do it, so can you. And no, it need not involve deprivation or unnecessary risk." Green Goddess Glamping's owner profiles so far have included a number of retired (as in after a career of 9-to-5's) travelers, so the focus of Becky Schade in this profile is paying attention to how to live on the road without the savings, retirement, and Social Security benefits many older travelers utilize. Having researched Becky's website, Interstellar Orchard, it's clear that "alternative lifestyle" doesn't mean "free and easy." She does think about her lifestyle of what she calls "deliberate living" and its relationship to the daily juggle of dollars and cents, of daily food and gas: "comparing money to happiness . . . spend your money on things that’ll net you the most happiness per dollar spent." 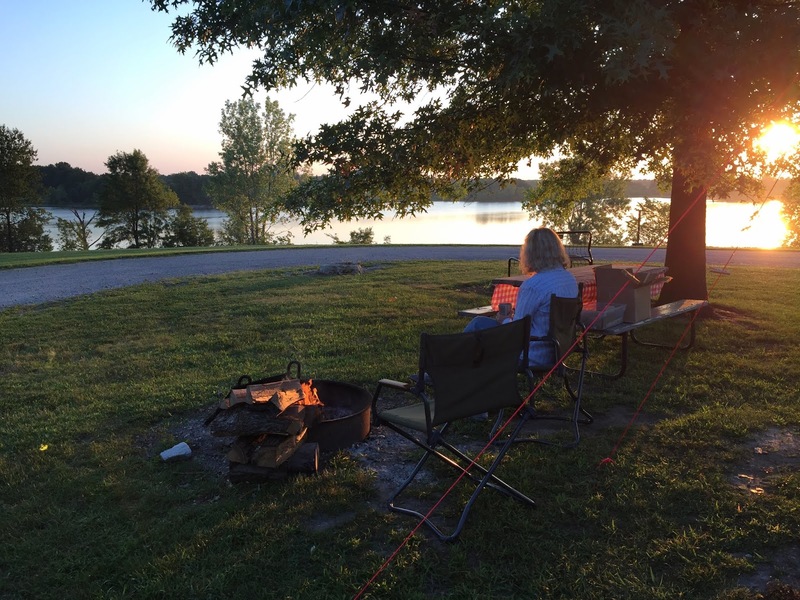 Along with the routines of camp and travel, Becky includes monthly and annual reviews for herself, assessing both her outer and inner experiences. "For the monthly review I divide my life into three basic categories: work, personal, and travel. Everything I do falls into one of these categories, and there is often overlap between them. Your categories may well be different than mine. "I look back over my to-do calendar for the month of everything I had written down, whether it was finished or not. Day by day it’s hard to see patterns, but when you take the time to look at the month as a whole like this, patterns emerge. I look at my best days and think on what I did those days that worked so well for each category, and write out answers. I do the same for the worst days. "Usually by the time I get to this point, it’s quite clear to see what’s working well and what isn’t, and make the necessary adjustments for the next month. Occasionally I do need to rest on my answers for a day or two, and come back to it." Schade's current home is a 2018 5X8 Hiker Highway Deluxe, by Hiker Trailer. It was a custom order "from the factory in Denver, Colorado, in October of 2017, and finally picked it up on September 21, 2018. Total cost? $9,624. "It's 12' 3" in total length, with the box measuring 5' by 8'. Up front is a toolbox containing an AGM battery, battery monitor, 600 watt pure sine inverter, and other electrical stuff. There's a 95 watt solar panel mounted on the front of the roof with a MaxxAir fan just behind. The spare tire is full size, and yes that's a small window in front, bracketed by vents where I can hook up a combo heating/AC unit in the future if I want." 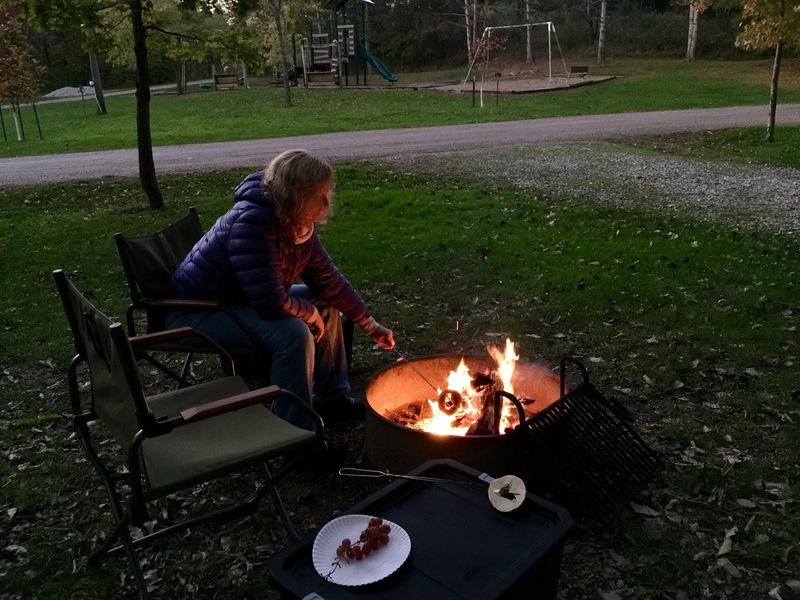 Unlike retired folks who have a steady, managed income, or like people who are still busy with careers and who camp on weekends and vacations, Becky has to plan her camping life to include opportunities for earning money. Articles in her blog include information on seasonal work and jobs that match well with an on-the-road lifestyle. 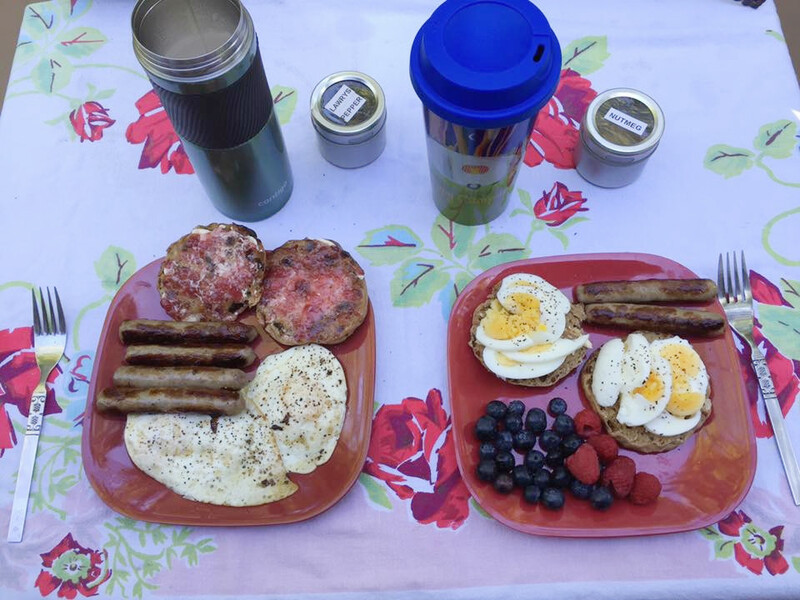 In her article "Comparing Work Options for RVers," Becky mentions how in 2012-2013, her first year as a full-time RVer, she "worked for Amazon in the fall, Lowe’s in the winter, and at a National Park from spring until the start of the next fall." In her article, she also discusses online employment opportunities. 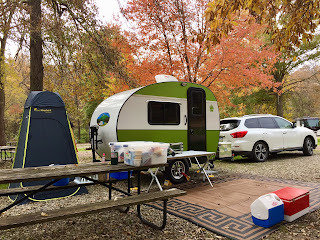 Her blog has a "Start Here" page that contains links to articles in the following categories: Full-time RVing, All About the Money, Deliberate Living, General RVing, Inspirational, and "Other" (about photography and blogging). Ms. Schade is a thoughtful, articulate traveler, and following her thoughts and journeys is both a travelogue and a reflective experience. Becky definitely doesn't spend all her time working, though. She plans and travels forth, boldly going where many RVers have gone before, but in her own style and timeline. Her webpage "Adventures" catalogues by the year her peripatetic existence, and she's traveled all over the U.S. and has also spent time in Canada. Her plans provide stability for her, yet she is also ready to be flexible: "All travel plans are written in jello and subject to change. What fun would it be if everything always went according to plan?" 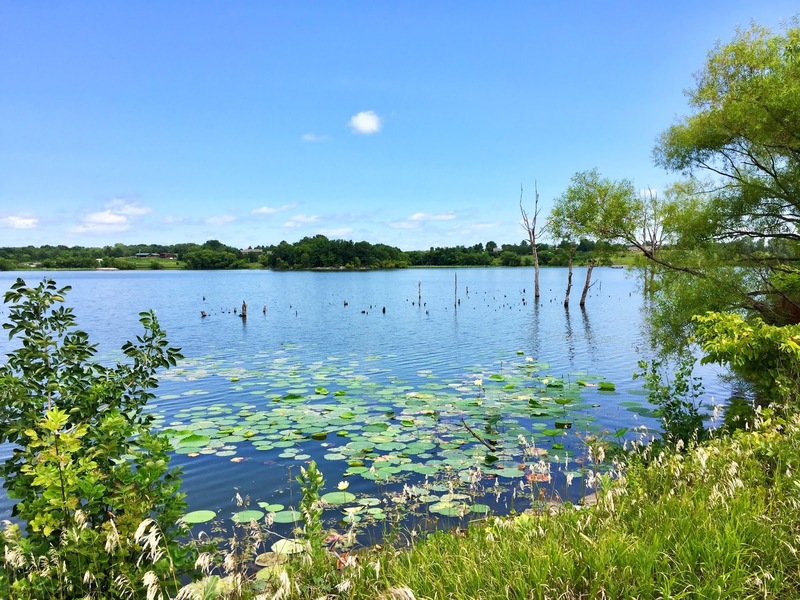 Becky's 2017 travels, for instance, included quite a few Walmart stops, boondocking sites, and campgrounds. Her travels and plans for this winter are much like her past cold seasons--traveling in the US Southwest: the Snyder Hill BLM, then getting her fill of big cacti near Ajo, AZ; camping near the American Girl Mine near Winterhaven, CA; and from there walking across the border to Mexico for dental care. She has enjoyed the Imperial Sand Dunes, and along the Colorado River watched the sun set. She finished off 2018 north of Quartzite, AZ, with a New Year's party with friends. "This’ll be my fourth winter in a row down in the desert Southwest. And while I love the desert, I really don’t need to hang out here until May again, waiting for other parts of the country to warm up. Been there, done that, ready for something new." As of this writing, the winter includes giving lecture-seminars at Rubber Tramp Rendezvous (RTR), and, after that, more time with Xscaper friends before her Big Plan kicks in. And her Big Plan is a twelve-week trip to Costa Rica to do volunteer work. "I’m going to be using my college degree for the first time since hitting the road, and volunteering at a wildlife rescue and rehabilitation center along the Pacific coast called WildSun. I’ll be there 12 weeks, averaging 40 hours a week, and in exchange I get housing for free." 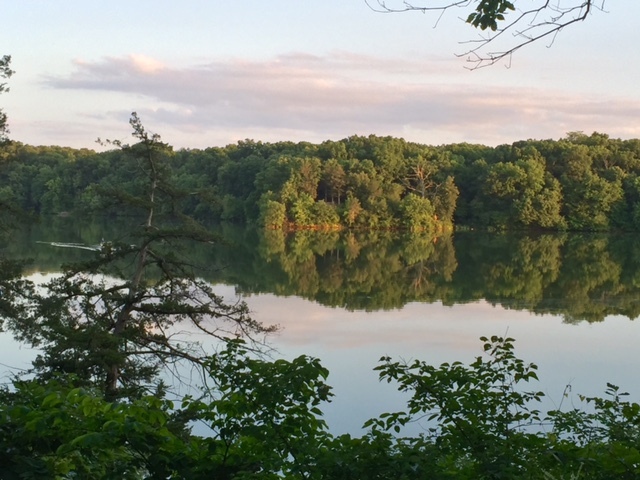 "Those of you familiar with work-camping are probably thinking that sounds like bad hours for no pay and you’d be right – my previous two volunteer positions required only 16-20 hours a week in exchange for my RV site. But this isn’t the typical volunteer gig. For starters the location can’t be beat, WildSun is located right next to a national park and very close to the ocean. During my off-time I’ll be hiking, beach combing, learning to surf, and improving my poi dancing skills. "But the biggest reason why I’m okay with working that many hours for no pay is that WildSun is a non-profit and my time is going to a good cause. WildSun’s big project currently is reintroducing the Scarlet Macaw to the Nicoya Peninsula, and I don’t mind working long hours to help them meet their goals. With my degree as a veterinary technician and previous experience with exotics, I’ll be helping nurse sick and injured animals to full health for release back into the wild which gives me the warm fuzzies. I’ll also be cleaning cages, building new enclosures, preparing food for the animals, and other more mundane tasks. But I don’t mind getting my hands dirty." Odd-numbered years are those that Becky visits her family and friends in Wisconsin, "so after reuniting with my rolling home in May I’ll be slowly traveling that direction. There are also plans for a backpacking trip in Yellowstone National Park this summer!" With selling her two RVing books (Solo Full-time RVing on a Budget and The Little Guide to Dreaming Big), online work, part-time work, and donations, Becky Schade is able to live a life filled with more choice than many. She started as "a newly minted young full-time RVer rearing to get out and see America," and now she shares her wisdom gained from experience. "There are a lot of folks that dream of perpetual travel and a life full of adventure, but don’t pursue it because it seems like such a fairy tale. Others try, but hit a wall and become discouraged when they discover how complicated it is to make the switch." Becky has managed to make that switch, and her website is an inspiration and wealth of knowledge. We wish her well in Costa Rica, sure that the land will be richer for her stay. Be sure to follow the link to Becky's travel blog, Interstellar Orchard. It contains a wealth of information and fun reading. I am surfing the net--actually Pinterest--and run across a photo of my RTTC Polar Bear model tiny trailer. 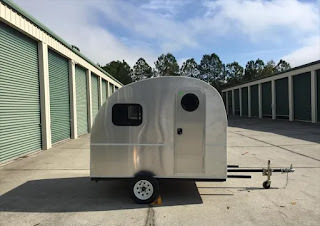 The photo is a front image for an article on tiny trailers that are under 1,500 pounds in dry weight which a person can stand up in, and for the first time I run across the term "standy." Five different trailers are featured, and the Polar Bear is the lead feature. Go, Green Goddess! In fact, it looks like the lead photo is actually my trailer! 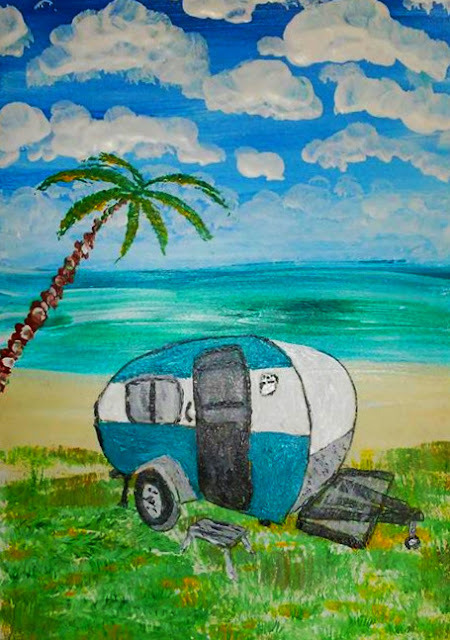 Interested in this new designation for my "standy" teardrop, I surf a bit more and land on the Teardrops n Tiny Travel Trailers forum, where there is the thread "Teardrop vs Standy Teardrop," posted in January of 2016. The "standy" has come a long way in three years. "Adirondackersouth," who posted the thread, wrote: "Standy is a large teardrop that one can almost if you are shorter than the average bear, stand up in. I am 5' 10" and this was impossible to do in the one and only Standy teardrop I have ever been on the order of 5 feet and x inches from top of the floor to the ceiling at the door. I think they should call them Stoop's and not a Standy's. But that is my opinion." Included with his remarks is how much he likes the retro look. " Yes, I am a softy for the old, classic look, for wood, for the 1930's - 1960's. There is just a richness and I suppose it speaks in the same tones that the newest house I ever owned was built in 1947 and the oldest 1886. I like them old!" My first footstep onto that sandy, "standy" trail was the Pinterest pinned photo and article from the website DoItYourselfRV, "5 Lightweight Standy Trailers Under 1,500 Lbs." The article highlights five different "standy" brands and models, beginning with the RTTC Polar Bear and ranging from $5,300 (Tiny Camper Company Stand Up Spam, 5'9" height) to $16,000 (The Relic, a vintage-style fiberglass trailer with "over six feet" of headroom). Two of the featured trailers (Little Guy Trailers MeerKat and Weiscraft Little Joe) are not provided with a price tag, and the base list price for the Polar Bear is listed at $7,975 for the standard model. By the way, here is my editorial rant about how much I dislike websites that post articles without a dateline. How old is the "standy" article? Is the information outdated? Who knows? I couldn't find a publication date. I can say that the current price listed on the RTTC website is $8,400 for a standard Polar Bear, and that reflects a recent increase. 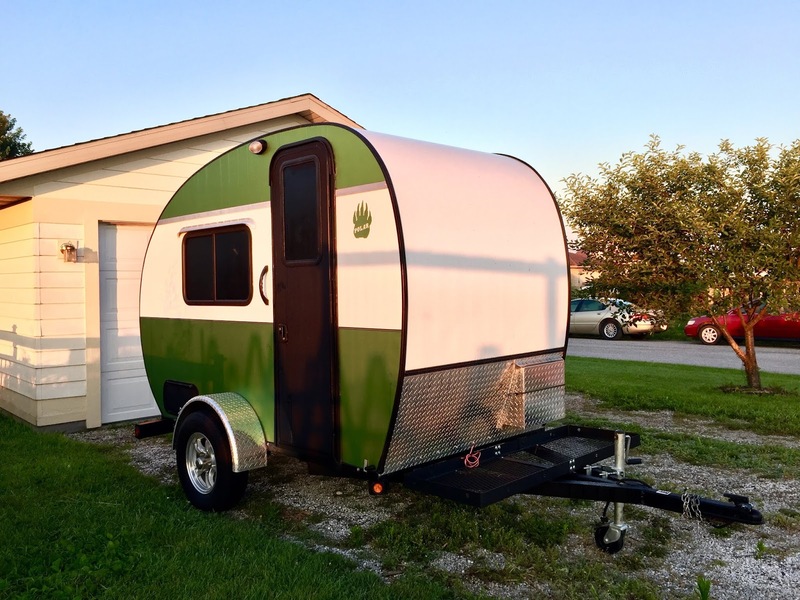 Green Goddess Glamping has written two three articles about tiny trailers and why campers like and buy them. 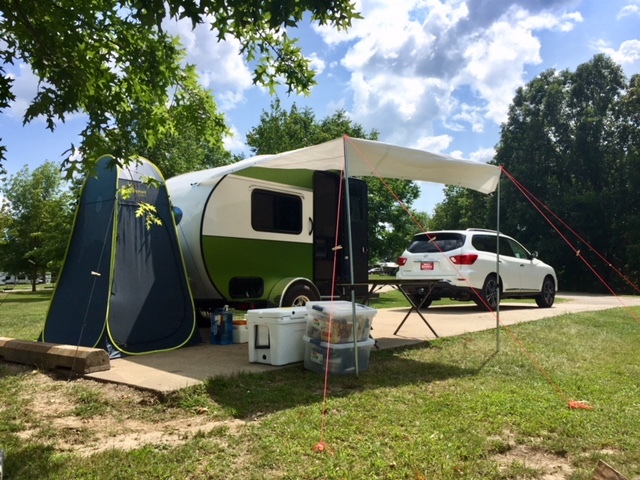 The last article listed was actually the first post ever written for this blog, explaining why my wife and I chose to buy a tiny trailer as our first camping rig beyond tenting. It also explains our desire for a "standy," rather than the traditional crawl-in, bed-only teardrop style (and we have no negative thoughts regarding that style, which just didn't meet our needs). I have written a couple of "hands-on" articles about daily routines and how they work with a tiny trailer. The small space requires adapting in basically two ways: 1) how to adapt to living outdoors (called "camping"), and 2) how to adapt to living in a tiny trailer from a traditional house's space. 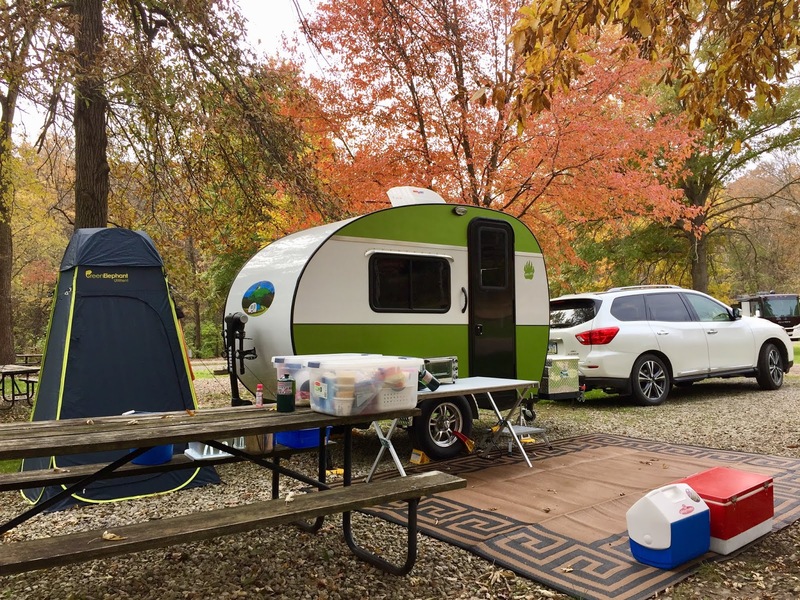 There are many reasons why the tiny trailer market is booming right now--ranging from the desire for a smaller RV footprint to price to the desire to not have to buy a trailer-specific tow vehicle. If you want to learn more regarding those concepts, then the Green Goddess articles listed above will do the trick. I like the term "standy," and that's the focus of this article. A "standy" provides a place to change, a workplace with a more traditional space, a more home-like seating possibility, inclement weather inside cooking, and as was mentioned above, that wonderful retro look that turns heads at the campground and on the road. I remember coming home from a recent trip. It was late summer and nearing lunchtime when I pulled past our town square. Standing at the stoplight were two women as I turned the corner. They both looked at the Green Goddess, bright and lively behind me, and one pointed, the women's heads leaning toward one another as they checked out my one-car parade. They were smiling as I pulled by, and I know they were thinking, "Gotta get me one of those." I'm so glad I went out and got me one. Labels: Why a Tiny Trailer? I find it ironic that after four months of blogging about the Green Goddess, the article that has been read the most is "Toilet or No Toilet for a Camper? ", which has gained about twice as many hits as my highest read travel article, "A Camping Trip as Sweet as Honey." It appears that regarding the topic of biological functions, we tiny campers are always curious about variations on the "poo in the loo" theme. Therefore, when an article gains my attention, I sometimes bookmark it for later study. After having set aside two articles on the topic of what "accomodation" to use when natures calls, it's time to report. One article is from a 28-year-old woman at Interstellar Orchard, who hit the road in 2012 at the age of twenty-eight and hasn't looked back. She writes the pragmatic article "Teardrop Trailer Bathroom and Kitchen Solutions." Another article was posted by a composite website called Curbed, entitled "RV toilets: Why I'll never have a bathroom in my camper." Curbed is a large site that states that its editorial purpose is "to advocate for the places where people live, by celebrating, chronicling, and explaining everything you need to know about homes, neighborhoods, and cities." The Interstellar Orchard writer, Becky Schade, traveled for years with her Casita trailer but in September of this year has picked up her new home, a 2018 Hiker Highway Deluxe, by Hiker Trailer. Curbed staff writer Megan Barber is based in Denver and camps with her family in an RV 4x4 Sportsmobile Sprinter. As general background information, here in Iowa, the only place to camp is at designated campgrounds unless you own or know someone who owns private land. There are very few opportunities for boondocking because the land is either privately own or state owned and regulated. 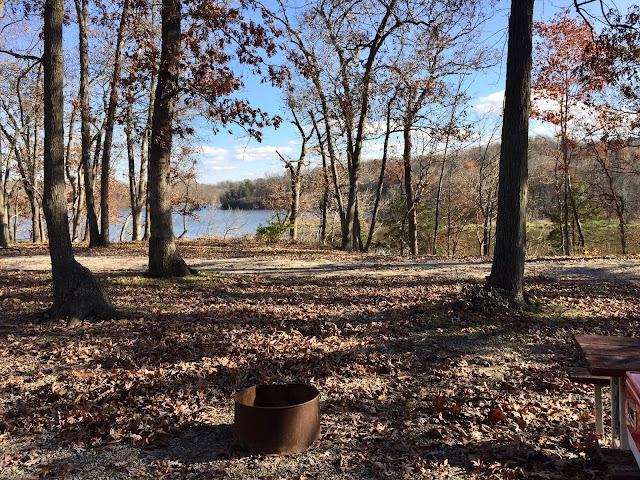 Therefore, camping includes access to a flush or pit toilet. Most issues for my wife and me center around middle-of-the-night excursions because of a full bladder. For nighttime urination, for me when alone I just use an empty juice or milk jug (one advantage of male plumbing). When camping with my wife, we use an outdoor utilitent and a portable toilet. During the day we use the campground's facilities. I have camped at sites with pit toilets, but my wife prefers a flush toilet (and so do I, actually). We both agree that cold weather has a positive effect on pit toilets by lessening smell and insects. In both articles mentioned above, the authors say that they head out into the woods with a shovel to do their business. 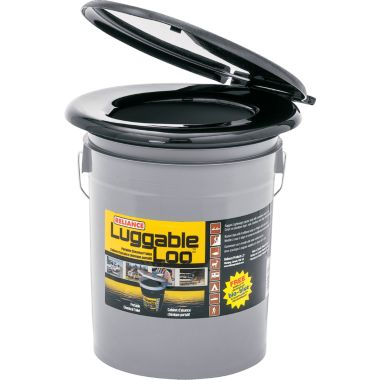 Becky Schade owns a Luggable Loo but hasn't used it yet. She boondocks and takes her foldable shovel out into the woods to take care of business. Becky does mention that there are federal and state guidelines for this practice, so I'll list her article again so that you can reference them (Bathroom Solutions). Megan Barber camps the American West with her family, and she also advocates the folding shovel approach, saying the following: "I think it’s a life skill to know how to pee and poop in the woods, and I’ve passed that down to my kids. When we’re in the backcountry, we grab a shovel and head to gorgeous vistas and serene forests." Barber mentions the "middle ground" of a portable toilet instead of the shovel or built-in toilet options. In my opinion, boondocking with miles of unpopulated space does open the possibility of grab-the-shovel option. However, with maintained campgrounds, campers need to use the facilities or bring their own portable solution, at the very least for solid wastes. 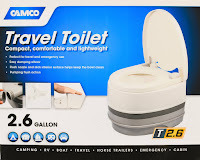 Portable toilets are discussed in my original article, "Toilet or No Toilet," and Becky Schade references the website Camp Addict, which reviews RV products, and to its toilet page. Megan Barber provides a couple of links, one which contains information and photos of a portable, compostable toilet for a van. So what have I come up with that my wife and I are comfortable with? Two solutions or choices for portable toilets. 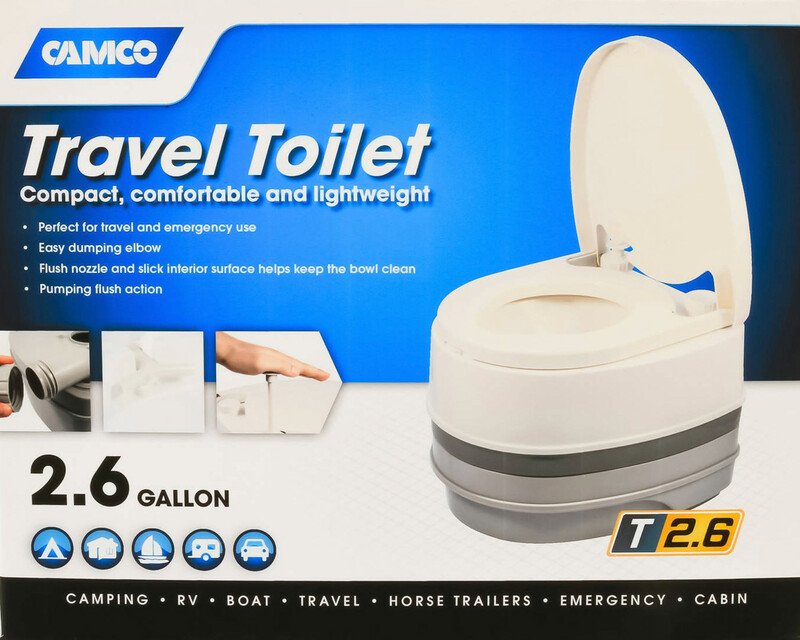 Our first choice during the summer is a Camco 2.6 gallon portable flushing toilet. It is much like what is used at home, and we usually clean it at the campground dumping station. I do that job and bring some rubber gloves and a small bottle of general purpose disinfectant for the last rinse of the holding tank. We have yet to use the Camco for anything other than liquid waste. This fall, though, we moved into weather that was freezing, so we felt that we needed another option besides a water-flushing portable toilet. 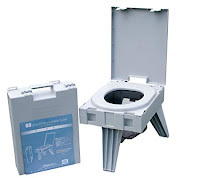 After research, we decided that the Cleanwaste Go Anywhere portable toilet was best for us. The waste bag kits are a little pricey, but the system is easy to use (not as easy as the commode at home, but, hey). I am experimenting now with bio-compostable plastic bags and kitty litter/pet wood chips to find a cheaper nighttime pee solution. I have used the Cleanwaste toilet once this fall. It was a windy snowstorm outside, so rather than walking to the campground's chemical toilet, I set up the Cleanwaste in my tiny camper and used it. No problems, but I did notice the the enclosed air space in a tiny camper has its limitations for venting odors. 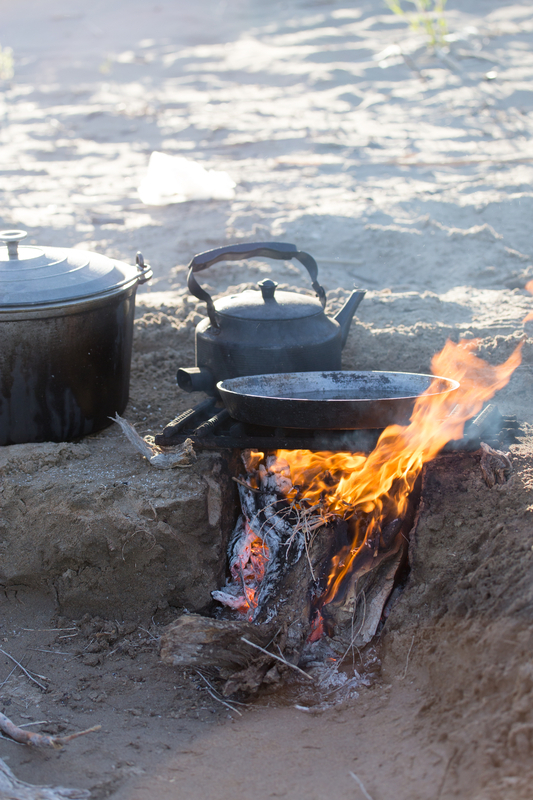 As Megan Barber writes, "But a camper without black water won’t have as many opportunities to stink. And unlike your plumbing at home, you can’t just flush and forget." Becky Schade says, "As for the bucket, it lives in the back of Bertha [her pickup], which has an adequately tall topper to be able to sit on the thing inside. The back windows are tinted so people can’t see in, and this way I won’t get smells inside my living space." Here are Megan Barber's positive points for not having a camper with a bathroom. Personally, I think Barber's last point is a bit of a stretch. Although I enjoy exploring, I can find plenty of reasons for heading out into the great outdoors that don't include a shovel and a roll of toilet paper. I think we must all find our personal level of comfort and ease regarding camping and our physical needs. It will differ from person to person because of life experience, personality, and how spry we are. 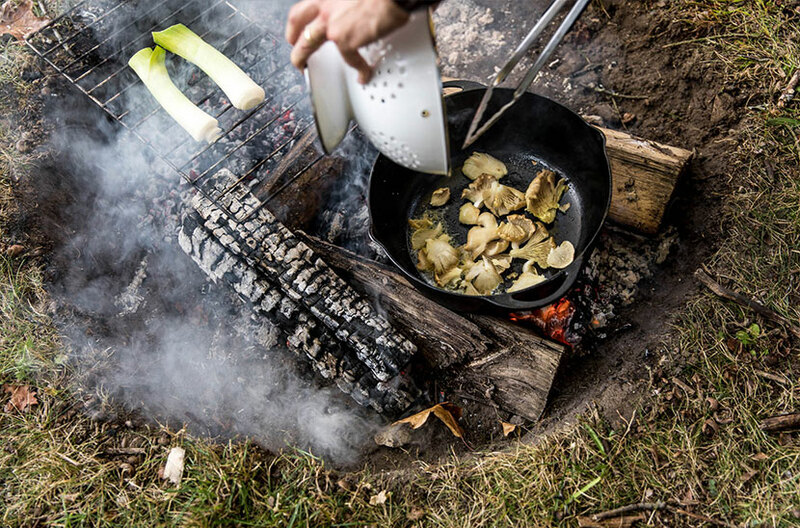 Importantly, though, I also believe that camping takes us outside our habitual lifestyle. What is novel or even uncomfortable initially can become the "camping norm" after a few times out of the house and into the world of campgrounds and tiny campers. Whatever style of camping we choose and howsoever we arrive at meeting our comfort needs, there is a piece of equipment on the market to make the process easier, whether it be a shovel, a portable toilet, or a full-on bathroom in your camper. 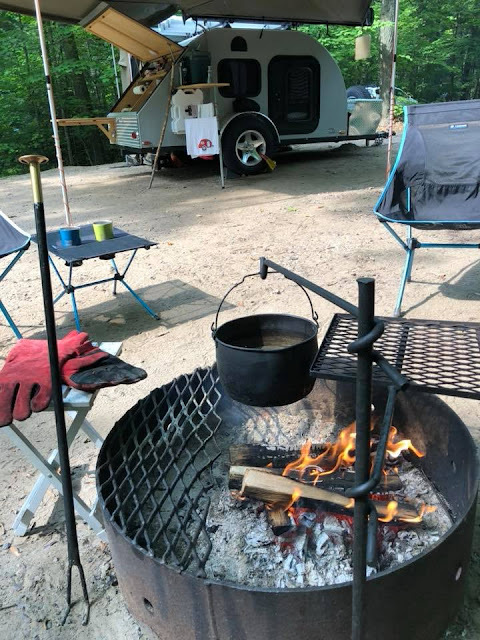 From my research, I believe most tiny trailer campers are seeking that "middle ground" that avoids blackwater tanks and winterizing procedures yet is an accomodation more refined that a squat in the woods. That is the course my wife and I took just by asking ourselves what we needed and wanted. Portable toilets require a bit more initial set-up when camping, but the knowledge that no sewage is connected to the camper is a source of lasting satisfaction. About Wednesday Mom would start getting ready for the weekend, first checking Dad and her clothes and bedding in the little Terry trailer they owned. Dad would be at work and we kids at school, but Mom would be getting ready for the our weekend camping up in the Sierra Nevadas, usually up around Taylorsville on Indian Creek. She loved camping, I think because it took Dad away from the TV and all those things that got him so riled up. We kids also were getting older, and she had to know that soon we'd be not around so much--high school sports, friends and jobs. For my brother and me, though, during the ages of 10-16--those were the golden camping years for our family, with my older sister coming along every now and then. By Friday afternoon, everything was ready to go. My brother and I had our satchels of camping clothes packed (I don't remember Mom packing them), Mom had the food packed except for the ice box, and we were ready for Dad to get off work. Sometimes he'd get home, bringing the ice, and off we'd head up Highway 70. Sometimes, though, Dad would be tired, and then we'd get to bed early and be on the road by 4 or 5 A.M. the next morning. Now that I own a tiny trailer, there are a couple things I realize, based on my tiny trailer camping experience, that I've never really thought of before. 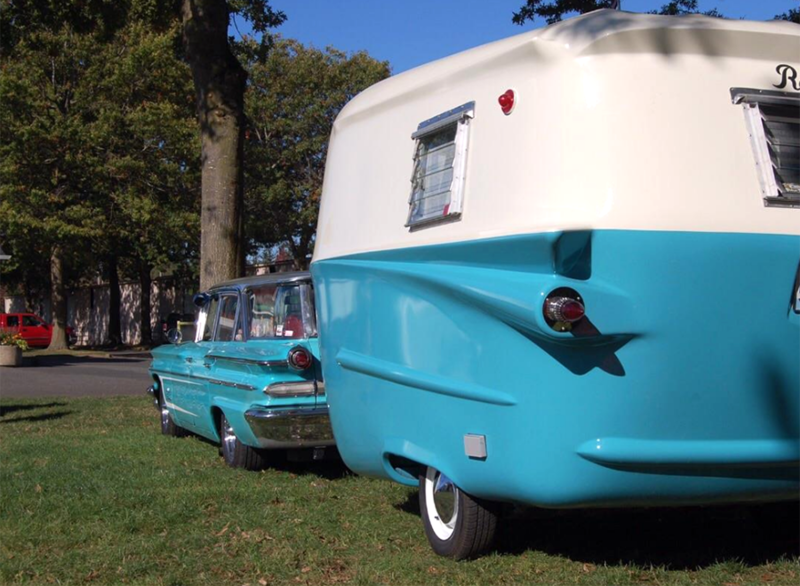 One is that Mom and Dad owned a tiny camping trailer, although it seemed pretty big at the time. I don't know what year, but the trailer was a Terry, and it didn't have a toilet or shower. Looking at photos of old Terrys, it was probably the 13-foot model, having that squarish look and the Terry logo on the front. I remember it having a stove and ice box refrigerator. My mom and dad slept in the trailer while my brother and I slept in an army surplus pup tent outside. That was mostly for ease and for our independence, though, because there was a small bed area up front if the table was knocked down. 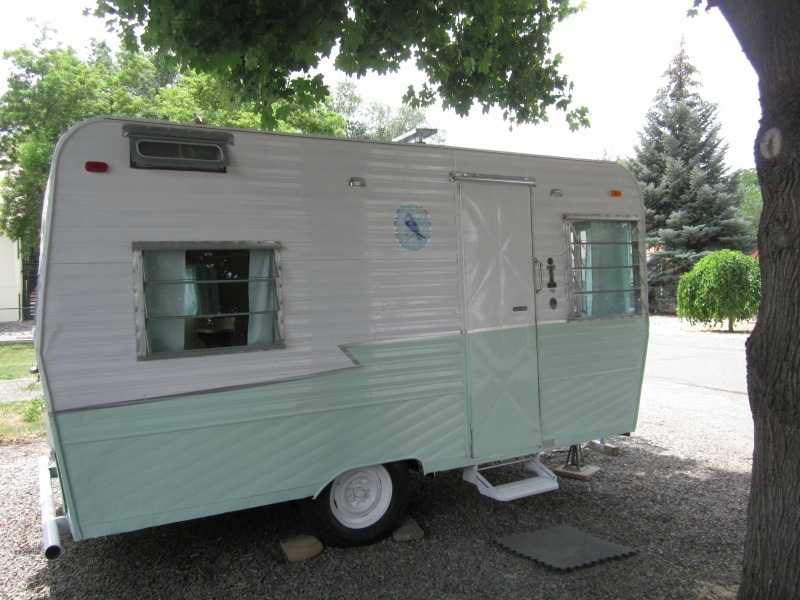 The photos on this post are from the Little Vintage Trailer blog, where a 1964 13-foot box (16-foot total length) Terry travel trailer was premiered. Boy, looking at the photos sure brings back memories of some of the best and most sweetly simple times with my parents. Fishing, "rafting" the stream with our air mattresses, eating Mom's macaroni or potato salad, listening to the DJ Wolfman Jack on an old portable Zenith radio while gathered around the evening campfire, falling asleep to distant songs of coyotes--it was as if time held its breath and allowed us to think of nothing more than enjoying the day and the moment. 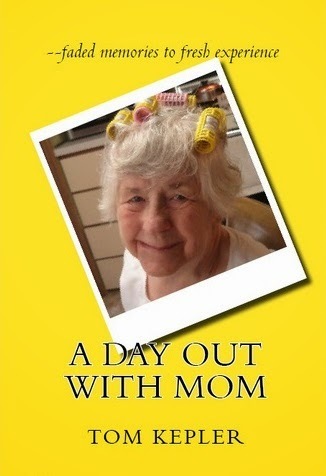 Mom mentions one camping episode in my memoir, A Day Out with Mom. She said to me, "One time your sister had a boy come along to camp with us. We were down at the creek, and your sister let that boy eat the whole bowl of potato salad. I said to him, 'How could you go and eat the whole thing?' and he said, 'Your potato salad is really good!' I was so mad at him! It was our food to eat, after all, but it was kind of funny.'" I realize now how happy Mom was to get away. Her eyesight was bad, and she'd never driven a car. She only went somewhere when Dad went somewhere. She probably liked getting out of the house, especially since she had her tiny house to stay in while she and her family spent some quality time together among the pines. Another thing I now realize--or have a name for--is that my family went boondocking! Dad would pull down an old logging road off federal land onto Indian Creek and camp there, next to the stream, a meadow across the way. It was our favorite spot. Others also camped there, but we were usually alone unless friends came and also camped with us. No piped water, no electricity, no toilets--just primitive or "off the grid" or boondocking. We kids saw it as "that's how you camp," not realizing that more established opportunities existed. All these years later I now realize how much my dad just liked to get away--heading into the Sierra Nevadas, pulling down some old, rough logging road no longer used, setting up camp, wrapping a tarp around three closely-spaced trees to provide privacy for the thunder pot. We were self-sufficient, and I realize now that those times camping were among the most relaxed and happy experiences I have of my dad and mom. 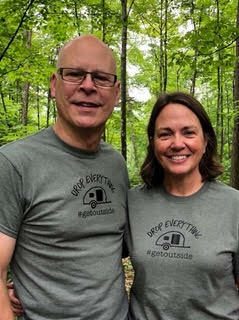 Maybe that's the gift my mom and dad gave me with their tiny trailer and their off-the-grid boondocking--that nature sets up in the simplest, most efficient way, and that's something we should pay attention to and not try to complicate too much. It's something we should appreciate and enjoy. That's what I remember most about Mom and Dad, that they just wanted some simple enjoyment, surrounded by family--and even with Wolfman Jack howling in the night, with a turn of a switch, there was silence, and in the distance, way up the mountain, a family of coyotes singing down the summer moon. We own what we love and love what we own. That's the saying, anyway. We tiny trailer owners can also truly say the trailers we own give us lots of love and joy right back at us. And there are a few special teardrop owners who paint radiant, colorful pictures of their lovely trailers. RTTC Grizzly owner Jim Cook is one of those artists who spreads the joy with his palate of vivid color. Last year while camping, I put on my "naturalist" hat and drew a few sketches of plants and trees. I tried my hand at drawing leaves and such, and the results were just recognizable enough for me to have a true appreciation of those folks who can actually paint and draw with skill. I love the vivid colors Jim Cook chooses, and I love the freedom and openness of his brush strokes. They remind me of why I camp--to leave behind the strictures of routine and to explore. Jim's use of color and how he boldly applies color . . . well, just looking at his paintings is liberating. 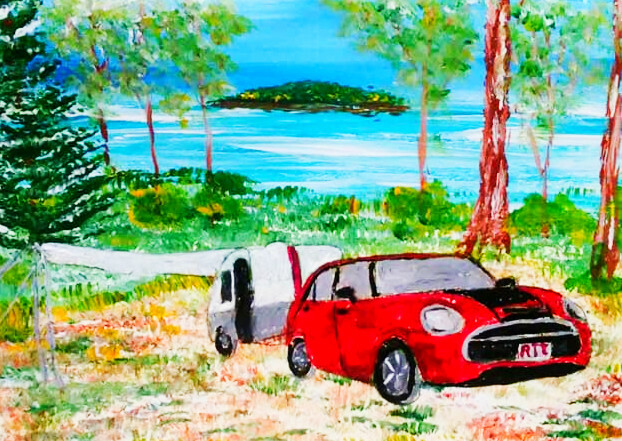 "This painting was inspired by David Hammer and his MINI Cooper. Yes, he pulls a Grizzly with a MINI Cooper. I was trying to encourage the members of our Facebook site to post more pictures in 2017 in order to increase interest and membership. One week in late 2017, it was David's photo that was selected by our judges (the Sechrist family)." "The Southern Christmas one was a bit of a fantasy card," says Jim. "I lived most of my adult life up in northern Vermont and would dream of a real 'white Christmas' with white sand and palm trees. Now, I live down south and get to enjoy much warmer weather. We normally camp over New Years along the SC coast." 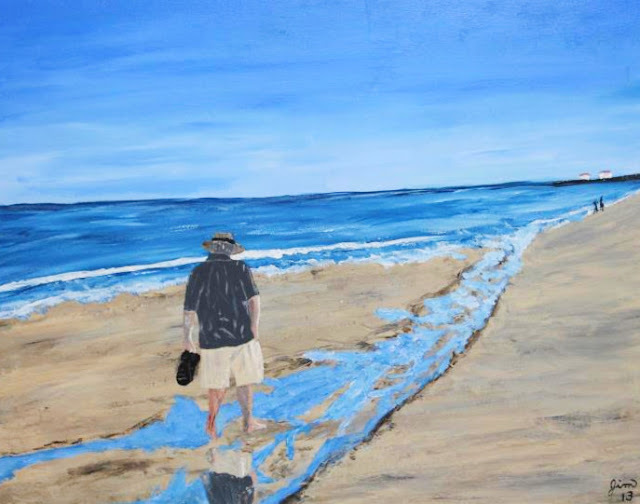 Jim paints using acrylic paints, and the paintings featured in this article are painted on card stock, so they are the size of greeting cards. 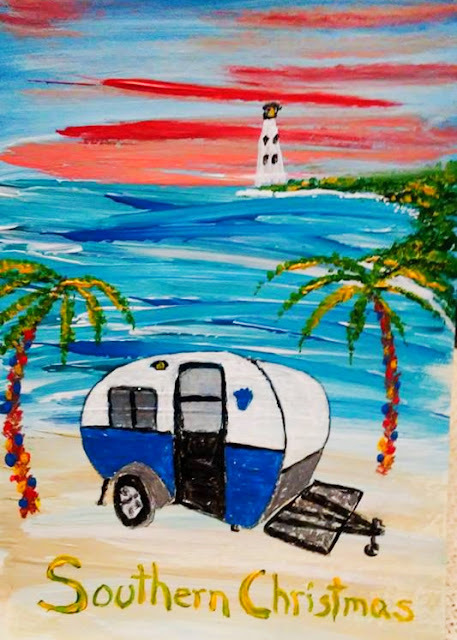 He says, "My hope is to one day be able to bring my paints and some card stock when on the road camping, be able to paint, and store and sell my paintings without taking up a lot of room. I figure most people desire to have greeting cards to buy, but maybe they want something a little different like a hand painted greeting card. I sell them for five or six dollars apiece. 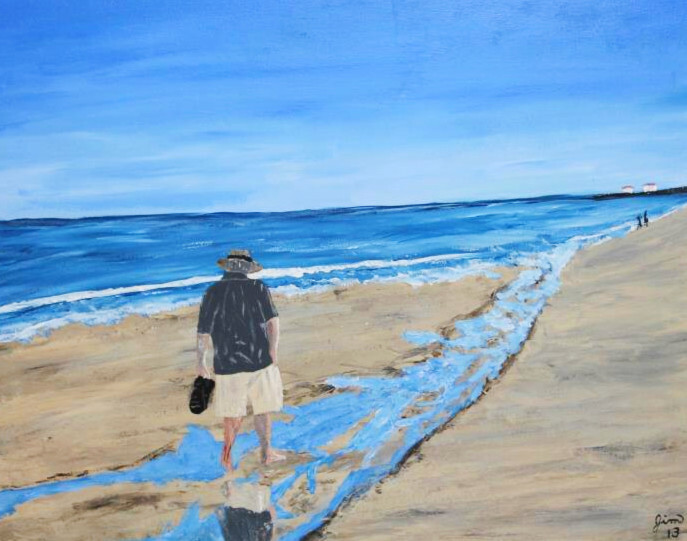 No, I will never get rich painting them, but they allow me to play around with the paint, make a little money, and not have to have a huge amount of space for canvas and finished inventory." 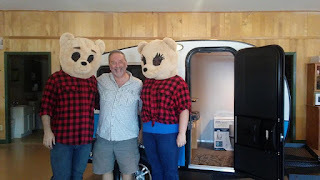 Jim and his wife Annette own a Grizzly and have several major camping excursions planned for 2019, including Florida, South Carolina, Connecticut, Maryland, Virginia and North Carolina. "I am sure you have figured out by now that I am a huge fan of the RTTC brand. I work hard to promote the brand any chance I get." Jim's enthusiasm and energy for promoting the RTTC tiny trailer brand has been so effective that his relationship with the builder has been formalized by RTTC in January. We would like to announce that Jim Cook has become our RTTC Am"BEAR"sador. 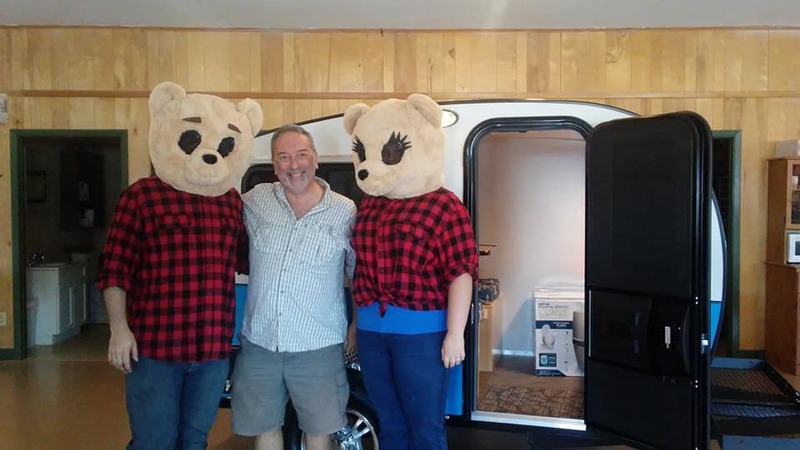 Jim will be taking over all Facebook questions, phone calls when show room isn't open, heading up "bear-a-vans" and other gatherings across the USA. We are so thankful for all that Jim has done for RTTC so far. Thank you, Jim Cook, and look forward to even more exciting things to come. 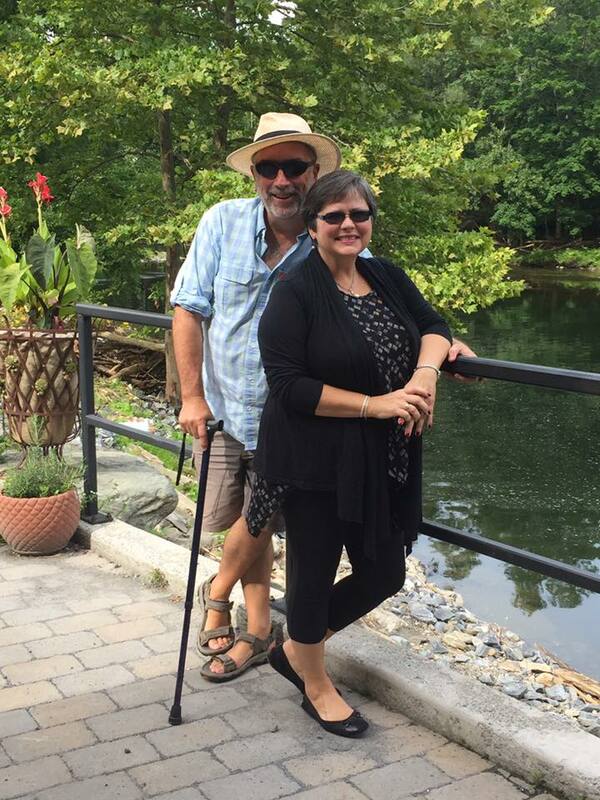 ALSO, March 30th, 2019 (Saturday), we will be having a customer appreciation day to welcome aboard Jim Cook, at RTTC headquarters in Pilot Mountain, NC. We will be providing food and door prizes. Looking forward to seeing you there. Wonder why people tiny trailer camp? This painting answers the question. And so we fittingly end this article with sand in our shoes and a song in our heart. I'd love to have this greeting card right now to lessen the chill of the -19 degree weather moaning its arctic dirge outside. A little art to soften the arctic . . . or something like that. Thanks, Jim, for sending a little sunshine our way.